USAC issued Wave 26 on Friday, October 5th. Cumulative funding as of Wave 26 was $1.82 billion. The administrative window opened October 1st. As explained in USAC’s Schools and Libraries News Brief of September 28th, this three-month window gives applicants an opportunity to update their EPC entity profiles (including NSLP information for schools and school districts) in preparation for FY 2019 applications. The administrative window will remain open until roughly January 7th at which point EPC entity profiles will be locked during the Form 471 application window (estimated to be January 10th – March 20th). USAC’s new Invoice Deadline Extension Request (“IDER”) tool is now available in EPC. The tool permits applicants and service providers to request automatic 120-day invoice deadline extensions for FRNs from FY 2016 forward. Invoice extensions for earlier funding years may be requested, as before, through the legacy BEAR system. Please remember that IDERs must be filed on or before the original invoice deadlines. The next key invoice deadline is October 29th for FY 2017 recurring service FRNs. The IDER tool is accessed from the applicant page using the pull-down menu in the upper righthand corner. Extensions may be requested for a list of FRNs, each separated by a comma. Pre-submission, click the “CHECK ELIGIBILITY” button. Review the results to make sure that extensions are eligible for those FRNs, then “SUBMIT” the request. Please note one potentially confusing aspect on extended invoice deadlines. If the new IDER tool is used to extend the Current Invoice Deadline Date of 10/29/2019, the Extended Invoice Deadline Date will be 2/26/2019. Applicants who had previously requested IDERs using the legacy BEAR system may instead see extended deadline dates of 2/25/2019. These day earlier deadlines are still being displayed in the FRN Extension Table. We expect USAC to correct this discrepancy and have been assured that the 26th is the correct deadline extension date for all related FRNs — not that applicants should be pushing the boundary of any E-rate deadline. Combine multiple documents into a single ZIP file requiring only one upload. Start a new EPC session by logging out and logging back in. This approach normally works but becomes tedious if more than a couple of documents are involved. Try uploading the document the next day (if time permits). When nothing else seems to work, call CSB or initiate a customer service request within EPC. Our best advice to users encountering 404 errors is to try a different browser or computer, or to simply wait awhile. Be careful when using the alternative sites indicated to check either SPAC filings by service providers or invoice deadline extensions on FRNs; the data on the FRN Status Tool is not always consistent. The FCC issued an appeal order (DA 18-1000) overturning USAC’s denial of special construction funding for Farmington Municipal Schools in New Mexico. The decision is significant in part because it deals with the potential impact of state match funding on special construction bid evaluations. In 2016, Farmington filed a Form 470 and issued an RFP seeking bids on leased lit fiber, leased dark fiber, and a self-provisioned network. The district received bids from several service providers, including one for a self-provisioned network and one for a leased dark fiber network, both with special construction charges. Farmington evaluated the bids, properly assigning price of the total cost of ownership of eligible services over a 20-year period as the primary factor. Other factors considered included (a) ability to adhere to the rollout timeframe, (b) supporting requirements in the RFP, (c) proposed contract terms, (d) service reliability, (e) offering a turn-key solution, (f) scalability, and (g) references. The higher total cost of the winning bid was offset by the other factors. During PIA review, Farmington responded to inquiries regarding the total cost calculations and the weighting of all the evaluation factors. In its response, the district also mentioned that it had calculated and compared total post-discount costs under both proposals. Traditionally, when comparing pre- and post-discount costs of eligible services, the cost ratio of competing bids would be the same. In New Mexico (and 21 other approved states), however, applicants are eligible for additional discounts on special construction if matched by state funding. Everything else being equal, this means that the larger the percentage of total costs attributed to special construction, rather than monthly recurring charges, the lower the net cost to the applicant. Here’s an example assuming two bids, both for the same total costs over the life of the project, but with different proportions of special construction costs and recurring costs. The example assumes that the applicant has a normal E-rate discount of 50% and will receive an additional 10% discount and matching state funds for its special construction charges. 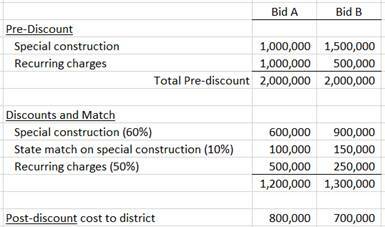 Note that Bid B, with the higher special construction charge, results in a lower net cost to the district. The FCC reversed the USAC denial finding that Farmington had properly used total costs, not net district costs, in its evaluation. This was a positive decision for Farmington but should serve as a cautionary warning for all applicants considering state matching funds. E-rate rules require price comparisons of total eligible costs, not an applicant’s net costs after discounts.